You know, I guess there are aspects of most businesses that are just grueling, tedious, and really difficult, BUT… going to The Lodge Studios in Indianapolis, Indiana is not…one…of…those. Instead, it is one of the most delightful experiences you could ever imagine on your “day-dreamiest” of days. For years, Michael Graham recorded my music as he worked for other publishers. Eventually, he went home to Indianapolis…I moved to Kentucky, where I started my own online business…and now we work together! It’s all good. Recently, I had one of the best experiences I’ve ever had in my business career at The Lodge Studios in Indy. As you might guess, it is very difficult to ask choral directors to give up their rehearsal time…or at least enough rehearsal time to record almost 100 octavos in numerous voicings. 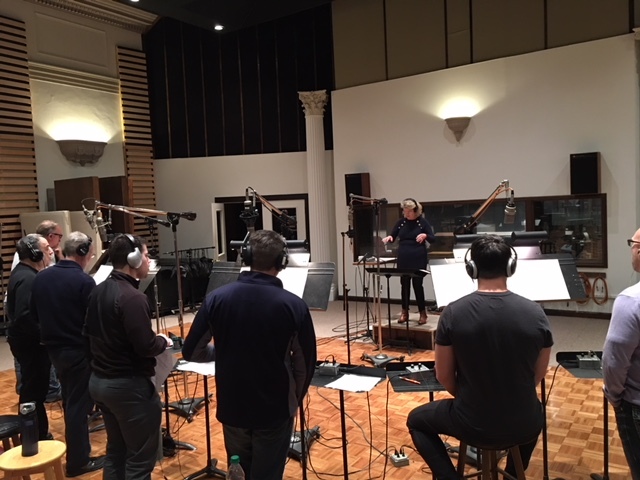 There just isn’t enough time in anyone’s life to do that type of thing completely, so I went to The Lodge Studios to work with singers who do it as a part of their living as professional musicians. It is quite exciting to think that someone can actually spend a life recording music, sing with others they really like as friends…and make me a happy publisher at the same time. The joy of singing is incredibly evident in the singers’ faces at The Lodge. There is no need to ask, “Can you do this?” Of course they can! They can sing anything, and it is amazing to be a part of such an experience. They sing it once…maybe twice…then…it’s good! 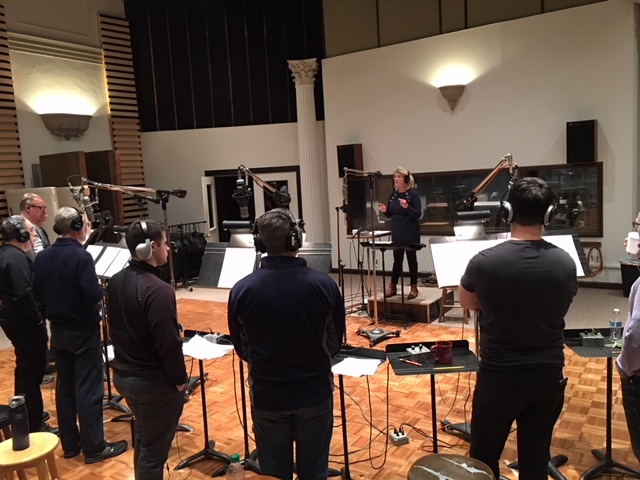 I have rarely worked with professional studio singers in my life, so this was a real treat…to pull a piece together and record it totally in 20-30 minutes. That was amazing to me. The dedication and commitment of these singers is second to none…and… they had so much fun in the process…which also made me have fun, too. The days at The Lodge flew by for me, which is truly amazing, given that I was on my feet for nine hours a day for three days. However, they were, too! It was an effort that brought benefits to my business, given that I now have 45 additional recordings of my work. However, the greatest benefit to me was seeing a different type of musician at work in his element, all carefully engineered by Michael Graham. As you can see, the photos in this blog post were of the TTBB/TTB/TBB day, but I can tell you without reservation, the women who sing at The Lodge are equally skilled and professional. The choral director in me felt totally useless, as I wondered if they even needed me at all. However, Michael said having a person conduct in front of the singers always make a tremendous difference. I thought that was interesting: Even with all the musical skill, knowledge, professionalism, and vocal abilities I had before me, the singers seem to be at their best when someone is conducting. We all do things better when we all do the things we’re really good at doing…when everyone is in it together! I had the time of my life conducting the wonderful singers at The Lodge. I hope to go back to record pieces for the future. When I came home to my office, my computer, my files, my equipment…I realized that my modest surroundings would create another opportunity to visit The Lodge to record my work and others’ as well. This was a good thing for me to do. It was fun. It was purposeful. It was music.